Two truths are equally crucial for us to understand in this passage. 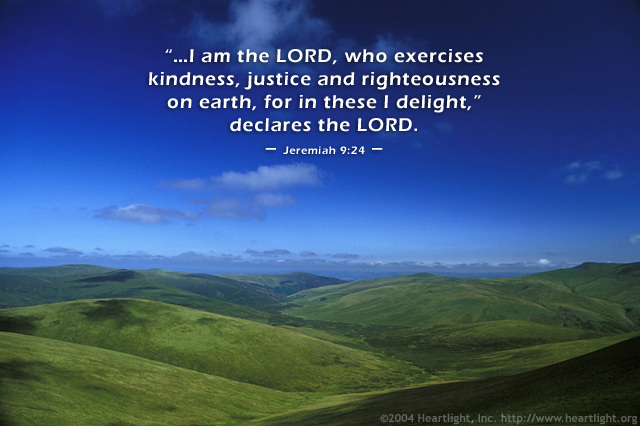 First, God is kind, just and righteous. Second, he delights in these things when he sees them in us. So what does your life stand for? Let's be like our Father and take on the lifestyle of loving kindness, the cause of justice for all, and the character of righteousness. Why? Because we should have no greater joy than to bring delight to the Father! Almighty and Holy God, may my life delight you and bring you joy. However, dear Father, I am aware that my character falls far short of your holiness and righteousness, and the mercy and grace I display to others pales in comparison to the mercy and grace you have shown toward me. So please, Father, help me know those areas where I most need to grow to be pleasing to you and to bless others with your grace. Thank you for giving me the Holy Spirit to help transform me. In Jesus' name I pray. Amen. Heartlight is proud to support and promote Compassion International.